June 10, 2014 February 10, 2016 ~ Sara W.
I originally posted the following post on Over the Big Moon (OTBM) under the title of Having a Merciful Heart. As has become my custom during the week prior to the third Sunday, I am featuring a previous OTBM post here in anticipation of my new OTBM post this Sunday. Normally I wouldn’t do so, but I did do tweaks to this post to make it less holiday focused since it was first published in December 2013. My Mom battled Ovarian Cancer for five years. In the latter part of those five years, the battle grew increasingly more difficult. She was always good to put a smile on about the whole affair. People would ask her how she was feeling and she would give an optimistic response. I knew differently. I recall there was one gentleman at church that would say, “How are you, really?” I guess he was catching on that my Mom wasn’t offering up her true feelings and state of physical well-being. It wasn’t that she was trying to lie, I think she just thought it best for everyone if they didn’t worry about her. I suppose I don’t really know what her purpose was in keeping a strong upper lip on the matter. As I sit here, I wish I could ask her why she kept so many in the dark. In some ways, I’ve made a conscious decision to do the opposite, but at the same time my default is to put on that ever-smiling face no matter what. Before I go further, let me say that I do not suggest that we should constantly be putting our dirty laundry out, nor carry around a sour disposition, nor spout to all the woes and heartbreak we feel. I truly believe that constantly feeding negative thoughts begets more negative thinking. Perhaps that is one of the reasons my Mom kept her times of sorrow private. She had an attitude of optimism. In that same breath though, I think it’s important that we allow ourselves to be vulnerable amongst our loved ones. It’s this misconception that everyone is doing perfectly fine that creates this false feeling to the downtrodden that they are alone in their suffering. I know that is exactly how I felt when I experienced Postpartum Depression (PPD). In my eyes, every Mom I had met spoke of an immediate connection with their child and joy beyond compare. I loved and adored my infant daughter, but I was not experiencing those same feelings that they were describing. I applaud the first woman who opened up and shared her less-than-positive feelings regarding post childbirth. It’s that same reason that I have since strived to be open about my own trials. Since I am, apparently, quite good at hiding my pain during my daily activities, I’ve had to be forward in sharing my true feelings. Even close friends seem to be baffled when I confess to them that I am barely coping in my daily life. But, I think it’s important that women, and men, realize that pain and suffering is not set aside just for them individually. We all must endure and we all must be merciful. I have had the opportunity to be a listening ear to many women over the past years. In my efforts to be honest about my challenges, others have felt comfortable in sharing theirs with me. Some stories included pains I cannot comprehend. I believe it takes great courage for us to confide in another regarding our deepest suffering. In my respect for their courage and trust in me, I held their stories private. But, sadly, I later overheard other women speak unkind words and make judgments regarding these women who had confided in me. I wanted to shout out, “If only you knew what they were dealing with privately, you would not be so quick to judge.” So as not to damage the trust that those courageous women had placed in me, I held my tongue. I simply tried to suggest to the gossiping women that these other women may be dealing with more than they understood. That experience, more than any other, taught me that we ought not make unrighteous judgments. Every person has their own story and struggle and rarely, if ever, do we have the whole picture. I once had the pleasure of spending time with this sweet couple. The husband was sharing with me how kind-hearted and tender his wife is in everything she does. He gave the example that even when they’re driving on the road and someone cuts them off, his wife is quick to come up with a myriad of valid reasons as to why the driver did so. He admitted that he would quickly become agitated until her suggestions of “perhaps they didn’t know it was their turn-off,” “maybe they have a loved one who is ill and needs to get to the hospital,” or simply, “they must be having a hard day” would calm his nerves and change his heart. When he shared that story, it encouraged me to reconsider people’s unpleasant actions and try to find the unoffensive reasoning behind it. I once overheard another couple talking about their occasional misunderstandings. The husband said to his wife, “Whenever I say something, just know that I mean it in the most positive way possible.” An easy out on his part, but likely true nonetheless. There are so many ways to interpret actions, aren’t there? Often we are quick to assume the worst. What I’m trying to say is let’s be slow to judge, quick to find the positive, and courageous enough to be vulnerable from time to time. 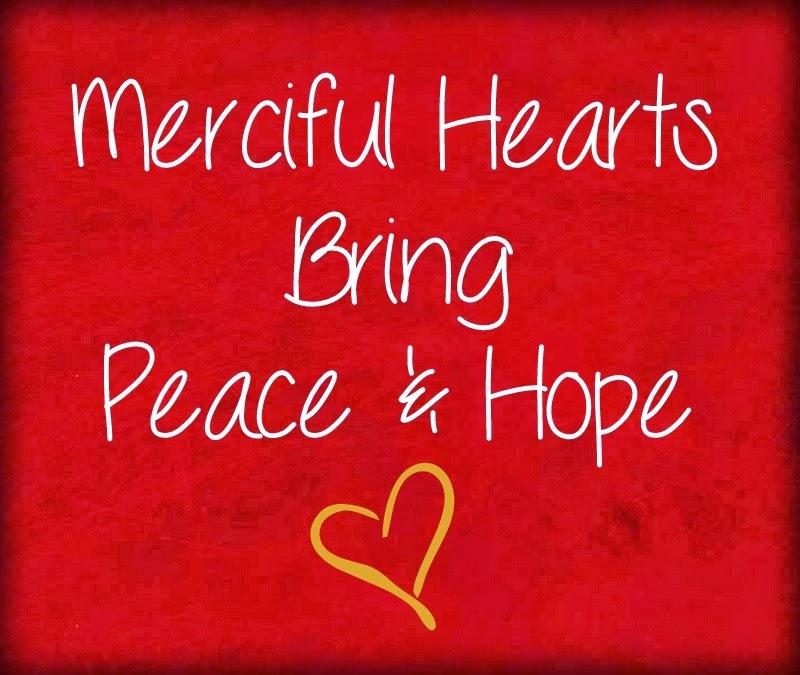 If we but try to bear one another’s burdens and joys with merciful hearts, we will each be blessed with more peace and hope. Again, you’ve done a beautiful job. What you are doing matters, even to us older grandmother types. I’m sure it broke your mother’s heart to leave you and your grandchildren. Watch for the tender mercies.